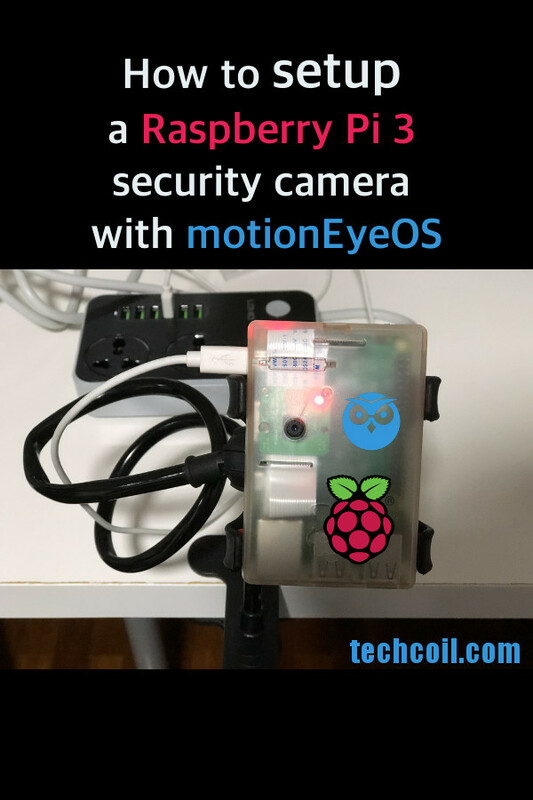 After I got the hardware, I went on to download the MotionEyeOS image for my Raspberry Pi 3. Calin Crisan had created a page for us to download different releases of MotionEyeOS for different Single Board Computers. I chose motioneyeos-raspberrypi3-20160410.img.gz and saved it onto the file system of my Windows machine. After my Win32 Disk Imager completed writing the MotionEyeOS onto my microSD card, I inserted the microSD card into the microSD card slot on my Raspberry Pi 3 board. I then proceeded to connect my Raspberry Pi Camera module to the Raspberry Pi 3 board and put them inside the case enclosure. To have a glimpse of what will happen the first time my Raspberry Pi 3 CCTV boots up, I connected my Samsung monitor and my Logitech keyboard to it. I also connected my Raspberry Pi 3 with my network cable so that I could configure it via a web browser. Lastly, I connected my Raspberry Pi 3 CCTV to my Belkin micro USB cable which was in turned connected to my USB wall plug charger. Among the initial configurations, my MotionEyeOS also started syslogd, the watchdog, brownout detector, eudev, http date updater, crond, sshd, proftpd. smbd, nmbd and motioneye. The IP address that was allocated to my MotionEyeOS was also shown before the login prompt. It felt insecure to have my Raspberry Pi 3 CCTV showing the video stream from its camera without any login prompt. As such, I proceeded to set some passwords to guard accesses to my Raspberry Pi 3. To apply access control to my Rasberry Pi 3 CCTV, I would need to login as the admin user. At the login prompt, I entered admin as the username, left the password field blank and clicked on Login. After that, the browser would show the video stream from my camera again. In MotionEyeOS, the admin user is given the rights to configure MotionEyeOS. The username of the admin user cannot be changed. To set a password for the admin user, I entered a password in the Admin Username text field. The surveillance user is only granted view access to the video stream from my Raspberry Pi 3 camera. Configuring a username and password for the surveillance user would ensure that the video stream from my Raspberry Pi 3 CCTV camera only displays after either the surveillance user or admin user logs in successfully. To create a surveillance user, I entered a username in the Surveillance Username text field and a password in the Surveillance Password text field. I clicked Yes to make MotionEyeOS reboot itself. After my Raspberry Pi 3 CCTV started up again, I was shown the login prompt. I keyed in my admin user credentials to continue on with the rest of the configurations. Since I do not reside in a region that is part of the UTC timezone, the timestamp reflected on my video stream was incorrect. An inaccurate time display would create inconvenience when I wanted to verify whether the deliveryman from the postal service had really attempted to come to my house at the time that they claimed in their failed delivery sms message. To configure the Time Zone on my Raspberry Pi CCTV, I selected Asia/Singapore from the Time Zone dropbox and clicked the Apply button at the top of the screen to commit the changes. I clicked Yes when MotionEyeOS asked to reboot itself. After my Raspberry Pi 3 CCTV started up again, I keyed in my admin user credentials to continue on with the other configurations. Since Raspberry Pi 3 comes with wifi capability, configuring my CCTV to connect to my home network connection wirelessly would eliminate the need for another cable for network communications. To configure wireless access, I first clicked on the first button at the top left corner to bring out the configurations drawer. I then clicked on the toggle button for Wireless Network to turn on wireless network connections. This would make the Wireless Network Name and Wireless Network Key text fields appear for me to key in my home wireless network details. Once I was done with my Wireless Network configurations, I clicked the Apply button and rebooted my Raspberry Pi 3 CCTV. When my Raspberry Pi 3 CCTV started up, I keyed in my admin user credentials to continue on with the other configurations. In this case, I would enter 192.168.0.107 in the location bar of my browser from a computer that is connected to my home network so as to connect to my Raspberry Pi 3 CCTV via its wifi interface. Seeing the video stream would be sufficient for me to determine that the camera is working. As such, I went on to turn off the camera LED indicator so that I can reduce the power consumption of my Raspberry Pi 3 CCTV. To do so, I first clicked on the first button on the top left of the screen to bring out the configurations drawer. To turn off the LED indicator of the camera, I clicked on the toggle button for Enable CSI Camera Led to switch it off. I then click on the Apply button at the top and rebooted my Raspberry Pi 3 CCTV. After my Raspberry Pi 3 CCTV booted up again, I keyed in the admin user credentials to continue with the other configurations. By default, MotionEyeOS keeps pictures and movies for as long as it can. However, I figured out that I would only require the still images and movies be kept for one month. As such, I went on to configure my Raspberry Pi 3 CCTV to keep pictures and movies for a maximum of 1 month. To configure the preservation period of pictures and movies, I first clicked on the first button on the top left of the screen to bring out the configurations drawer. I then chose the For One Month option for Preserve Pictures and Preserve Movies and clicked Ok on the prompts that appeared. Once I was done with that, I clicked on the Apply button at the top to persist the configurations and rebooted my Raspberry Pi 3 CCTV. With that, I was satisfied with the configurations that I wanted for my Raspberry Pi 3 CCTV. Without HTTPS, it would be insecure to access my Raspberry Pi 3 CCTV camera from outside my home network. Protecting the HTTP traffic between a web browser and my Raspberry Pi 3 CCTV camera would require a reverse proxy server, a domain name and a SSL certificate. Through my experience in setting up a LEMP web server on Raspberry Pi 3 and setting up a free CA signed SSL certificate to secure a WordPress site hosted on it, I had the hardware and software resources to secure access to my Raspberry Pi 3 CCTV camera with HTTPS. Since I own a couple of domain names, I could create a sub domain from one of the domain names. And since I am leveraging on DigitalOcean name servers to translate my domain names into IP addresses, I could create a sub domain via DigitalOcean's control panel. To create a sub domain via DigitalOcean's control panel, I logged into my Digital Ocean account and go to the "Networking" page. I then proceeded to the "Domain" tab to select a domain which I wanted to create a sub domain from. After clicking on the "Create Record" button, I was able to get the IP address of my home router by sending a ping to cctv.adomainname.com. And being able to reach my home router will meant that I was able to reach the LEMP server running on my Raspberry Pi 3. Once I was sure that the nginx server running on my Raspberry Pi 3 could receive HTTP requests directed at my sub domain, I proceeded on with creating the nginx configurations to facilitate the Let's Encrypt client in acquiring the SSL certificate for my sub domain. This process took a very long time to complete but it was worth the effort as it would make communicating with my server more secure.